How does one get a job reviewing movies? I’ve often wondered. There’s nothing further to that. Just…how? Please? 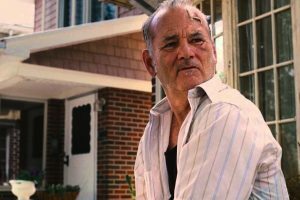 St Vincent – DVD Library borrow: Bill Murray & Melissa McCarthy. Melissa plays it more subtle in this role than some of her other recent ones, allowing Murray to do his thing. This was a good flick, funny, tragic and irreverent as are most movies when Murray is on his game. All hail, Bill, whose been a trusted friend of my funny bone since Caddyshack. This movie has a few WTF moments (like, how in the hell does a mother think it’s okay to leave her 10yr old with her curmudgeonly, alcoholic neighbor that she JUST MET? Even in her desperate circumstances… damn), and it strays into schmaltzy sentimental territory at the end, but over all worth a watch. Especially for Bill Murray fans. Room – DVD Library borrow: Dear Heaven above this broke my freaking heart. What a film. Brie Larsson more than deserved her Oscar for this gut wrenching journey of a movie. It was so far beyond good in terms of acting, moodiness, sound, editing… everything, that there really isn’t much more you can say. But be prepared to cry for the whole 2 hours. Or at least you will if you’re a wuss for abused-kid-triumphs stories like me. 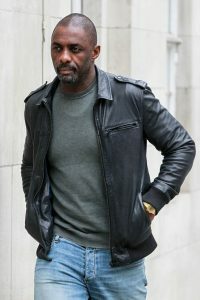 DAMN you are so much better than this awful film Idris. No Good Deed – Netflix: No good qualities. No, I stand corrected. Great actors saved it from being one of the worst movies I’ve ever seen (Taraji P. Henson of Empire fame and Idris Alba of everything that is awesome), but I have to wonder why actors of their calibre didn’t pull out of this cliché ridden piece of exploitation. They owe a loan shark money or something? I love a good junk food thriller movie from time to time, but this was so ridiculous that it stopped being fun to poke fun at about half way through. Biggest problem being Henson’s character, who was presented as a street smart lawyer who used to try violent cases… who inexplicably lets a stranger into her house at night while she has her children home and her husband is away. Also Alba’s madman was a cardboard cutout misogynist. He can do so much better but this dumb script gave him nowhere to go. The one time Idris took off his shirt wasn’t worth the other 89 minutes of my life. (For a much better attempt at a kill chasy scream flick you can see on Netflix which still falls into the junk food TV category, try one called Hush, about a deaf woman who matches wits with a homicidal maniac). 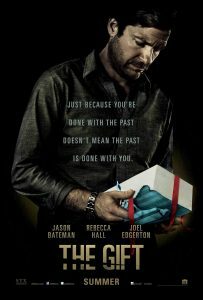 The Gift – DVD Library borrow: I’ll freely admit to being a huge Jason Bateman fan, but I don’t need to be generous with my opinions to praise this subtly creepy domestic thriller. Written, directed and acted in my Aussie Joel Edgerton, this is slick and intelligent, a slow burn story of revenge of the most foul kind. I think Bateman’s slow metamorphosis from the seemingly nice everyman to something much more layered and not nearly as nice is enthralling. Some reviewers have reviled the ending, but I liked where it went and thought the twist was in keeping with the sense of entitlement of the two male leads. It says a lot of subtle things about how toxic masculinity can be when it’s forced into extreme shapes, but it’s by no means preachy. It is at it’s heart an entertaining, scary flick meant to leave us with a bad taste in our mouths (it does, in the best kind of way). Rebecca Hall was terrific as Bateman’s wife and the main protagonist in a lot of scenes. Good to see Alison Tolman, from Fargo season 1, in a supporting role too.